These things can be dangerous. To be safe, I recommend you seek medical attention if you are bitten by a mukade. "Much has been alleged on the toxicity of centipede venom, but very little material on the subject has made its way into the scientific literature. As with tarantulas, this vast lack of medical reports on them more than likely indicates they are not medically significant. Like tarantulas, their perceived repulsive appearance by most people is probably the reason they are widely viewed as somehow dangerous and toxic. We do know that some of the larger centipedes, especially in tropical areas, can administer a painful stab, but none are known to be dangerous. All we can say for sure on the subject is that some can cause a painful bite, but that's absolutely all." "The most common scenario includes moderate to severe local symptoms associated with mild systemic symptoms. Local symptoms include pain, erythema, edema, lymphangitis/lymphadenitis, weakness, and paresthesias. Skin necrosis may occur at the site of envenomation during the weeks following the sting, but rarely becomes extensive and heals spontaneously. Systemic symptoms may include anxiety, fever, dizziness, palpitations, and nausea. " "Despite the striking appearance of the offender and the significant pain associated with a sting, treatment for centipede envenomation is essentially pain control and routine wound care." 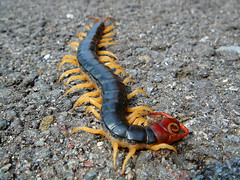 However, most of the cases being that of one of the (centipede rearing) authors and none of the centipedes were mukade. There is however, at least one paper about mukade bites which reports that they can cause Korsakoff's syndrome! You know they mean business when, unlike any other bug, they show no fear, and walk towards you. I was putting on my wetsuit one chilly December afternoon when I felt a movement next to my thigh, my inner thigh. I knew what it was. And it bit me. The pain was not so great as my panic as I felt it crawl down (could have been worse!) my leg, towards where the wetsuit was tighter and I thought it would bite me more. I used a knife to slit open the wetsuit to my calf, and when it escaped my friends dispatched it. At first I thought that it had only given me a nibble. I had experienced a mukade nibble in the past, when I awoke to find one on my upper torso. Two red bite marks were all that were left. It did not hurt all that much nor had any ill after effect (Partly perhaps because I used alkaline - ammonia - on the wound). And neither did it hurt all that much on that day, when a mukade shared my wetsuit. I continued to wake-board. The thrill of wake-boarding made me forget the pain. No worse than a bee sting I thought. But I was wrong. The next day, or the day after that, my left thigh had swollen to about 1.3 times it size. This is no mean feat. I do not have thin thighs. All the same I thought I would brave it out, and went jogging (I do this a lot). I thought I would flush the poison out with a good pump of blood with a little adrenaline. The leg around the bite became hard. By the third day I had a fever and was feeling generally weak. I went to the doctor. They gave me antibiotics and antihistamines I think. They told me that had I come immediately after the bite I would have saved myself a lot of bother. I was a 37 year old 70 Kg male. The mukade was not as big as the one in this picture. If your child gets bitten by one of these things, or if you get bitten on the neck, go a hospital immediately. Go to a hospital immediately anyway if you do not want to have serious swelling and general malaise. Who knows what would have happened had I not gone to the hospital at all. I was only after I had posted the first draft of this that I realised that Todd Baker << technowannabe had kindly linked to another rendition of this story. I find that insecticide does kill mukade if you douse them in it. But they do not die immediately. This is hearsay but, I believe that a lot of insecticide uses the same active ingredient which is a nerve gas to bugs. It does something to their nerve receptors or some-such, such that they loose, or gradually loose, muscular (if that is the right word) coordination. Flies sprayed with bug spray also go berserk in a way, changing course at even more regular intervals, bumping into things, flying upwards, downards, upside down. I seem to remember a mukade sprayed with bug spray loosing the coordination of its legs which, instead of moving in a controlled ripple, started to work all at once. The berserker mukade would probably have died. But in the meantime it went berserk. I got good with chopsticks and developed an ability to drop them in a jar of oil. When I gave up on the oil (see the other post linked above), I just chopsticked them out of my house. Do not attempt to chopstick a mukade unless you are very confident with chopsticks. There was a mukade in my crocs one evening this May. I felt that stabbing mukade pain, and while I did not see the culprit, I knoew what species of critter had bitten me. The next morning my foot still ached and was swollen so I went to see a nearby skin specialist. He told me that mukade do not inject their venom but bite and then spray their venom onto the surrounding skin. The venom seeps in both through the puncture wound that the mukade have made, and through the skin itself. However, mukade venom breaks down at high temperatures. The doctor recommended that if bitten by a mukade then immediate wash the surrounding area in water hot even to be just bearable. Hi Timothy, thanks for the informative post! I live in Imabari, Shikoku, in an old house, and this past week have killed four Mukade. I don't know why I'm seeing so many, but I found grabbing them with bar-b-que tongs, boiling up the kettle, and dunking them in a (boiling) bath kills them immediately. Well, to be honest, at first at least, before I got married, I would catch them with long chopsticks (this takes practice) and put them outside. The barbeque tongs work well too. We used some sort of white powder around our house. I don't think it was yellow. I forget the name. It was something simple, like "lime". They don't bite, in my experience, unless you stand, sit, roll over onto them. And they din't kill me. They don't even hurt *that* much. Just go to a doctor and get the jab. I kept amonia. Someone said that that a strong alakine would counteract the sting. Things to spread around your house to keep mukade out. Mukadekorori. special purpose white/yellowish powder for killing mukade. Highly toxic, quite expensive. bamboo charcoal chikutan 竹炭. Its effectiveness may be a superstition but I chucked it around anyway. It was very cheap or free since it was made nearby. Hydrated (slaked or slack) lime, chemical name calcium hydroxide＝ shousekkai 消石灰 . It is used by farmers to neutralise the ph of acidic soil. It is very cheap and not that poisonous. When mixed with water it produces a strong alkali that you should keep out of your eyes. It does not kill them but keeps them out (or in). Sold in large bags from gardening and agricultural supplies shops. Used to be used at schools for drawing the white lines on baseball grounds. chikusakueki 竹酢液. I am not sure what this is in English. It is a liquid. The Kanji mean Bamboo vinegar liquid. This too will create a line that mukade do not like to cross. Sold at home centers. Since this is likely to be an acid, I guess it should not be used in combination with the slaked lime. Okay, so I am now totally freaked out about the Mukade! We just moved to Japan and into a HUGE old house with our 18 month old daughter and a chihuahua. Today I found a tick on daughter's head and freaked out (not many ticks where I'm from) and got online to see what to watch out for here and now that I'm seeing people's posts about finding these creeps in their houses and beds etc... I am totally flipping out!! Mukade are pussies. The really scary bugs in Japan are the wasps. They say that the second sting from a giant wasp can kill you even if it is years after the first. "Mukade are pussies. The really scary bugs in Japan are the wasps. They say that the second sting from a giant wasp can kill you even if it is years after the first." They also say that the blade of a samurai sword is so sharp it cuts the very molecules in the air (creating a glowing aura) and can cut through a person without even touching them. I was bitten in the shoulder by a Mukade last night. And it seems not that dangerous even I'm allergic against insect stings. It was painful though. But not extremely painful. I was bitten too (as I think that I describe in the blog) and it was not that painful, but it did not get better, and I think that it was infected too. So I had antihystemines and antibiotics from a doctor on about the third day. I wish I had gone earlier. I guess it depends from case to case. Maybe it was an infection or it was the particular area you where bitten. Or some people are more weak against mukade venom. Who knows. I was bitten two times on different areas. And I never experienced serious problems. The bite in my shoulder is already healed. BTW. The bites of small Mukade much more painful than of the big ones. Perhaps small mukade are more painful (the big one that bit me was not all that painful), but perhaps big ones result in a wound that does not heal so well. It never really hurt all that much. But the area around the bit was hard and my thigh was pretty swollen and hard, and I think that I had a general malaise (lack of energy, like I had a cold or influenza). I was no wimp. I tried jogging it off but it was like I was just pumping the poison further around my body. My imagination? Anyway, I have found out since that by far the most dangerous organisms in Japan are the giant hornets ( suzume bachi, lit. "sparrow[-sized] bees"). Very few people have ever died from mukade skings. But the hornets kill 10-20 people a year. Like mukade giant horents are not scared of people. But mukade generally only bite when they are trodden on, or otherwise trapped. Giant hornets on the other hand, attack when you get too near their nest or food source. Hornets are teritorial. When they sting they inject a pheremonal marker that encourages other hornets from their hive to sting too. Hence people can get multiple stings and die. Or, more often perhaps, after the first sting one develops an allergy such that the second time one is stung, even many years later, one goes into anafalactic shock, and die due to "circulatory collapse and suffocation due to bronchial and tracheal swelling." If you kill one, its death rattle calls other hornets. Scary stuff. Mukade are pussies, beware of hornets. I, too, live in Imabari, Shikoku and I was just stung by a mukade trapped in the towel I was using to dry off with after a shower. Fortunately, it got me in the ankle when I was drying of my foot. It really hurt and got really swollen. I start feeling nauseous and feverish by the time I got to a local doctor (which fortunately will see people early) 20 minutes later. They had to drain the site and I had two drips and pain medicine. This is my second bite and many people told me the second is worse. I'm worried about the third. The doctor also said the sting was really deep. I use the white powder around and under my old Japanese house. I also use barusan smoke bombs. And I have used a special mukade mist bomb which I found at Mac drugstores. And, yes, I do keep a watch out for the hornets when I'm out in my garden. I also try to avoid buto, a Japanese no-see-um, which also are really painful and cause me to swell and itch terribly. Still, I love the Japanese country-side. Thanks. I recently got stung for the second time when a mukade decided to share our bed. I think it was only a nibble but it was surprisingly painful. Perhaps as you say one becomes sensitised, so that the second, third bite is more painful. I am still more scared of the hornets. I'd like a epinephrine autoinjector such as Epipen or Twinject, as sold over the counter in Canada I believe, but they are illegal in Japan, again afaik. Fortunately I live near a hospital (though on a mountain) but judging by their waiting times...I would like to be able inject myself or my kids. I love the Japanese countryside too.